Posted by Mastura Zaini-Roberts on Thursday, December 14th, 2017 at 10:21am. A lackluster credit score could bring up your interest rate and set the stage for years of higher payments. But if you work on improving your score, you'll end up paying less for your home loan. Many of us don't pay attention to our credit scores until the time comes to borrow money. But what you may not know is that having a credit score that's good, but not great, could cost you thousands of dollars in mortgage interest. In a recent LendingTree report, borrowers with the best credit scores (760 and above) were offered APRs of 4.18% in October, versus 4.44% for those whose scores ranged from 680 to 719. All told, those with better credit will end up saving over $12,000 over the life of their loans, assuming their borrowing is on par with the average. And that's reason enough to work on improving your credit score. If we go back to LendingTree's data, we can see that those awarded the most favorable interest rates on their mortgages were borrowers whose scores were either very good or excellent. So if your score is hovering in less desirable territory, it pays to work on bringing that number up -- especially if you're planning to apply for a home loan in the near future. If you're looking to increase your credit score, you'll need to focus on the key factors used to arrive at that number in the first place. Of the various things that make up a credit score, your payment history is the single most important. Work on paying all of your bills on time, and you should see your number go up. Ideally, you should be paying all of your bills not just on schedule, but in full -- but if the latter isn't possible on your credit card, for example, submitting the minimum on time will still help with your payment history. 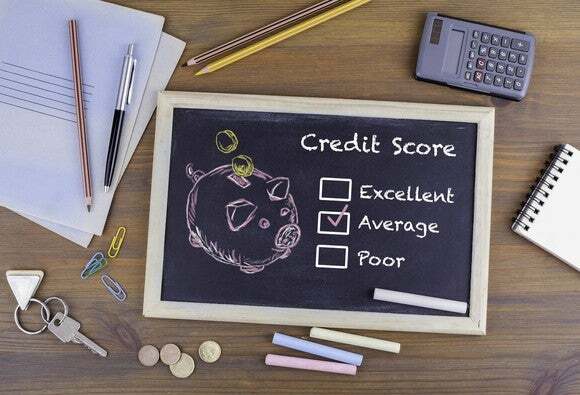 Another area to work on when you're looking to boost your credit score is your credit utilization ratio, which measures the extent to which you're using your available credit. If that ratio climbs above 30%, it could bring your score down, but if you keep it in favorable territory, which means 30% or below, it can have the opposite effect of helping your credit score. Let's say you have a total line of credit of $10,000, and you're carrying a $4,000 balance on your various credit cards. That would put your credit utilization ratio at 40%, but paying off $1,000 of what you owe will bring that ratio back down to where credit bureaus want it to be. Finally, don't discount the importance of reviewing your credit report for mistakes. It's estimated that one in five credit reports contains an error, and if yours has one, it could be bringing your score down. Unfortunately, a good 16% of Americans never check their credit reports, and they're the ones who are most at risk of losing out to errors. You're entitled to a free copy of your credit report every year from each of the three major bureaus (Equifax, Experian, and TransUnion), so be sure to request yours and study it. Incidentally, your credit report may not contain your actual score -- but these days, many banks and credit card companies make that number available so you don't have to pay to access it. If you're applying for a mortgage in the coming weeks or months, it pays to put some effort into improving your credit score beforehand. Remember, if you sign up for a 30-year loan, which is the route most folks go, you're locking in the same interest rate for three decades of your life -- so you might as well do what you can to keep that number as low as possible.